The clubhouse is growing toxic, but that's only a major story because of all the other things going wrong. While Brian Kenny figures out a new poll to convince his followers that Yadier Molina isn't a future Hall of Famer, let's take a close look at the St. Louis Cardinals as July nears the midway point and the trade deadline lies just a little under three weeks away. At 47-44 with the lowly yet sneaky Cincinnati Reds team rolling into town, the Cardinals have an opportunity to ride into the All Star Break on good terms and perhaps brew some optimism. The Reds have been very good to the Cardinals this year, basically representing a summer Christmas present every time the two teams square off. Things should go smoothly, but for some reason, I doubt they will. That's because every other day in Cardinal Nation represents a wrong turn or at the very least, a U-turn. A couple of wins and a couple losses or a clubhouse controversy. While I think the Bud Norris-Jordan Hicks mentoring game narrative was overcooked by instant reactions, it's the latest occurrence of the hometown team's shoe coming untied during a sprint. It's not good at all. However, that's not the only thing plaguing the Cardinals and submerging them in a barely above average holding pattern. Let's take a look at five problems. Sure, the Big Bear has ten home runs and 48 runs batted in, but he's also struck out 72 times, hit just nine doubles, and represented one of the worst cleanup hitters in baseball. How about the fact that Ozuna's .391 slugging percentage is ninth on the team of hitters with at least 150 at-bats? In 2017, Ozuna slugged well over .500. The hype train had the former Miami Marlin coming into the Cardinals lineup and giving them the boom stick in the middle of their lineup that was lacking during the past few seasons. June was hot and promising, but overall, Ozuna has underwhelmed, not to mention his defense in left field being rather anti-Gold Glove material. If the Cardinals are to mount any kind of comeback, Ozuna needs a better broom. For about seven weeks, Pham was putting up MVP caliber numbers, proving to Cardinals fans and himself that he was worth much more than a two year contract. After a 6 WAR season last year, expectations were high. Here was a guy who didn't make the team out of spring training, but ended up pushing Dexter Fowler to right field. After a hot start, Pham has sunk and his numbers aren't hiding anything. He's clinging to a .400 slugging percentage and the once league-best on base percentage is a pedestrian .328. Pham has struck out 89 times and been thrown out stealing six of 15 times. The 13 home runs and 59 runs scored are nice, but for the past six weeks, Pham has been a liability at the plate. He's 8 for his last 52 with 19 strikeouts, and it doesn't matter where he hits. The solid defense in center field is also missing, with Pham costing the team six runs in the outfield so far this year. Pham's eye sight has been in question, and for good reasons. There have been a handful of occasions where he completely misread a fly ball in center, and from a guy with ten years in the pros, that's not a good trend. A healthy bet on his own talent is looking quite risky at this moment. Pham was a f6.1 WAR player last year and now sits with a f1.2 WAR. It has hurt the team and the outfield. One starter is on pace for a 200 inning season, and that's Miles Mikolas, the mystery arrival from Tokyo. Behind him is Luke Weaver with 103.1 innings pitched, but you can cancel his chances out of reaching 200 innings in his first full season in the rotation with his five inning per start average. Carlos Martinez missed nearly a month, Adam Wainwright is semi-retired, and Alex Reyes' balloon popped after one start. One day, Michael Wacha will come back, but who knows what version will it be. Overall, the rotation isn't bad. Jack Flaherty has been fun to watch and hard on hitters and John Gant hasn't looked as boring as advertised. However, they don't pitch enough innings and aren't fairly reliable to give the pen a rest. There has been one complete game, and it was Mikolas. Other than that, most days the pen is coming into the game before the group qualifies for a quality start. One can't expect a team to mount a comeback if they can't score runs or their starters can't save the day on occasion. There's no immediate help on the horizon, unless the Cardinals change their minds about Dakota Hudson or Austin Gomber. I doubt the team makes a huge play for a starter, even if Cole Hamels and Chris Archer would really elevate this staff. I just doubt it. The starters have been solid all things considered, but the lack of innings is hurting the bullpen. The Cardinals have committed the most errors in baseball with 75 in just 91 games. For context, they committed 121 in 162 games last year-and few people wrote nice things about that group's play in the field. If it's not Jedd Gyorko with a fielding error, Matt Carpenter with a throwing error, or Ozuna looking for Narnia in left field, this year's team is a laughing stock. They give the opposition plenty of chances to get it right, and with a leaking pitching staff and feeble offense, the defense needs to be at a premium. It's not and I wouldn't expect it to change. Paul DeJong is good, but not great at short. Harrison Bader won't be in there every day if the Cardinals give Dexter Fowler a chance to reclaim his spot. Overall, either players took a step back or others are just being themselves. Only Kolten Wong has been exemplary in the field, and as of right now, the team can't clone him. Yes, the Michigan man with the sleek haircut hasn't improved in the dugout and appears to be losing his team one week at a time. From Fowler apparently not talking to him to dishing out fines based on the snitch report or just running out excuses, Matheny is hindering his team instead of helping it. In year seven, he hasn't learned how to operate a bullpen. It's like rewriting a manual for dummies only to have someone complain that the lettering isn't big enough. Brandon Kelly, an executive producer for 101.1 ESPN, put it best yesterday when assessing Matheny's value. Mike Matheny has come under fire multiple times recently for his leadership (or lackthereof). He's been mocked mercilessly for his tactical decision-making. Now, there are headlines about how poorly he comes off in Saxon's article. What, exactly, is he bringing to the table? Look, there's not much there left to defend. If you were put on trial right now to save Matheny's job, what would you say? Leadership skills? Apparently not. Winning record? Not for long. Trust of players? Nope. He knows how to look out from the dugout? That's not enough. 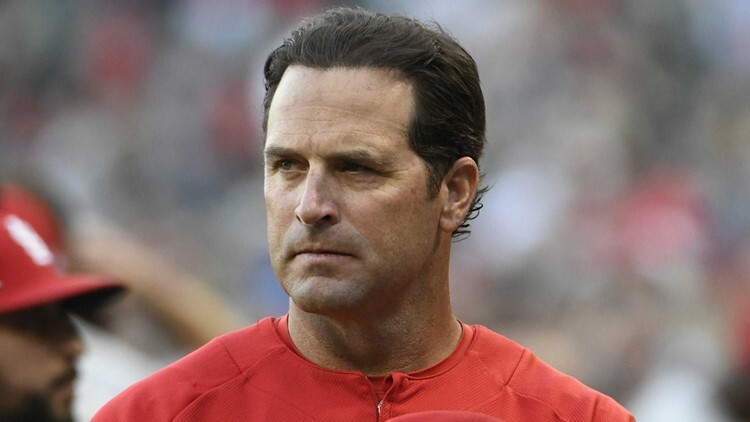 Matheny leads MLB managers in listless stares and impersonations more than anything. That's not the makings of a playoff team manager. It's one holding them back. Yes, there are other reasons the Cardinals are clinging above the .500 mark. Fowler has been a trainwreck this season. Jose Martinez has been the most consistent bat in the lineup, but he can't stay in the lineup due to his poor defense. Weaver has been up and down. Gyorko spent a month in hibernation. Ozuna likes ground balls too much. John Mabry is terrible at his job. Trust me, there's others. The clubhouse is growing toxic, but that's only a major story because of all the other things going wrong. Remember when Scott Rolen hated Tony La Russa 12 years ago? It was swept under the rug due to the Cardinals winning the World Series. Winning tromps every problem. This team is in decline, so the issues are flooding the boat. The Reds are in town and will greet the Cardinals in Cincinnati after the break, but I don't think that will be enough. I don't see this team making the playoffs. If that's the case, light the stick of dynamite early and start thinking about 2019 and beyond. There are too many things wrong with this team to fix in one season, so start the work now. The 2018 Cardinals aren't a disaster yet, but they aren't a lot of fun to watch.